This indenture made 13 August 1799 between Francis Johnson of the City of Philadelphia Esq. and Ann Kennedy of the same place, widow, Administrators of all and singular the goods and chattels Rights and Credits which were of the estate of David Kennedy, late of the sd. city Esq., deceased, of the one part to John Umsted of the County of Montgomery, Tanner, of the other part. 1: Containing 55 acres, 35 perches. 2: Containing 61 acres and 141 perches. 3: Containing 4 acres and 76 perches consists of two small tracts of land; 3 acres, 76 perches and 1 acre. And which several tracts or pieces of land above described contain in the whole 121 acres and 92 perches. BY virtue of an Order of the Orphans Court of Montgomery county, will be sold, by public sale, on Thursday, the 20th of December, instant, at 10 o'clock in the morning, on the premises, The three following PLANTATIONS, viz. 6 September 1799: John Umsted sells to Frederick Beiteman 20 acres (messuage and tract of land). 6 April 1804: John Umsted sells to John Winter 81 acres, 60 perches (messuage and tenement). 15 March 1806: John Umsted sells to Thomas Umstead 20 acres, 40 perches (messuage and tract of land). These sales total 121 acres, 100 perches. Deed says John Umsted bought 121 acres, 92 perches. John Umsted of Providence Township, yeoman, and Catherine, his wife, to Frederick Beilemann [Beiteman], practitioner, of Douglas Township, Montgomery County. £215, 11 shillings, for a messuage and tract of land containing 20 acres, part of 121 acres, 92 perches, David Kennedy's Executors to John Umsted. Signed: John Umsted, seal, Catherine, seal. Will dated 6 May 1803. Executors: Peter Custer, son-in-law and John Umstead Jun, innkeeper. John Umsted of Providence Township, innkeeper, and Catherine, his wife, to John Winter of Whitemarsh, innkeeper. £1700 for a messuage and tenement and ------- tracts of land [poor scan of deed which cuts off information]. Two tracts of 68 acres, and 14 acres ? perches, containing in the whole 81 acres, ---xty perches [Book 69:241 says 82 acres, 60 perches], part of above recited 121 acres, 92 perches. Whereas Francis Johnson of Philadelphia Esq. and Ann Kennedy of same, widow, Administrators of David Kennedy, late of Philadelphia Esq., deceased, to John Umsted three tracts of land containing in the whole 121 acres, 92 perches. Thomas Umstead, cordwainer, and Elizabeth, his wife, of Providence Township, to John Winter, innkeeper. £500 for that messuage or tenement and plantation or tract of land, containing 20 acres, 40 perches. Being the same that John and Catherine Umsted 15 March 1806 to Thomas Umstead "a messuage and tract of land" in Providence containing 20 acres, 40 perches in Book  page . Signed: Thomas Umstead, seal, Elizabeth, seal. And then the land passes out of Umstead ownership, although later deeds recite the Umstead deeds when the land is sold again by others. Note on the map that the adjoining parcels shown as John Umstead, Jr, Harmen Umstead, and Peter Umstead, along with Adolph and John Pennebecker belonged to the sons of Johannes Umstat and Hendrick Pannebecker. But they were there years earlier than 1799. 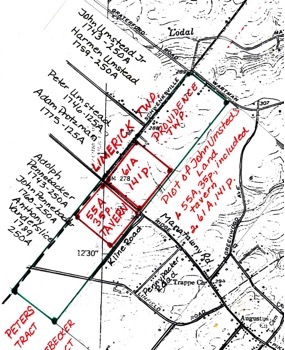 Note also the line on the map between Limerick and Providence Townships. For those enquiring minds, Mirriam-Webster provides a Legal Definition of Messuage: "a dwelling house with the adjacent buildings and curtilage and other adjoining lands used in connection with the household." Of course now we have to see what Curtilage means. Wiki says, "In law, the curtilage of a house or dwelling is the land immediately surrounding it, including any closely associated buildings and structures, but excluding any associated 'open fields beyond,' and also excluding any closely associated buildings, structures, or divisions that contain the separate intimate activities of their own respective occupants with those occupying residents being persons other than those residents of the house or dwelling of which the building is associated." It's a pretty good bet that this is John Umstad (Harman, John NS, Johannes), born October 4, 1766, in Limerick, Philadelphia Co, PA. He married in 1788 Catharine Boyer (1770 - ?) at St. James Church, Perkiomen, Phila Co, PA. He died January 9, 1851, in Chester Co, PA. He was in Brandywine Twp by 1807. He and Catharine are both buried at Brandywine Manor, Brandywine Twp, Chester Co, PA. It's also a pretty good bet that Thomas, to whom John sold part of the land in 1806 was his brother, Thomas Umsted, who was born February 22, 1768 (or 1767? ), in Philadelphia Co, PA, married in 1799 Elizabeth Rittenhouse (1779-1850). Thomas died September 1, 1846, in Philadelphia, PA. Both are buried at the Mennonite Cemetery in Germantown. John Umsted, innkeeper (he bought the land as John, tanner). John Umstead Jr., owner: same; adjacent to: John Penebacker; 2 story stone house 30 x 25 feet, 6 windows, 15 windowpanes; stone barn, 40 x 30 feet; total of 80 acres. [This is different from the total acreage on the deed but he did sell off some land]. Note that this is the year before the date of the deed, so obviously he was living on the property even though the official deed had not been made out. This is confirmed in the above ad for the sale of Kennedy's place which said John Umsted was on the property. Note that he is called John JR on the Direct House Tax. This MAY be because there were TWO John UMs in Providence. The Jr. does not necessarily mean he was the son of a John. Eleanor Mayfarth suggested at one point that Jr may have stood not for Junior, but for Jurat, a person who has taken an oath or who performs a duty on oath. Barbara Wentz, however informs me that this would only be on a signed official document, which this is not, so it's apparently Junior. P. 14: Tanners in Chester County, Pennsylvania. Although these lists pinpoint accurate dates, it must be remembered that they refer to the date of the deed alone. It is hard to ascertain how long a tannery remained in action and service to the community." [The info is from deeds, tax lists, and census]. Emas is presumably Enos, son of John the tanner and innkeeper. John and Phillip are presumably his sons as well. the stones. The Umsteads were among the earliest settlers of the township. Side by side lie John Umstead and wife, and side by side with them lie their nine sons - Thomas, Philip, John, Joseph, Ephraim, Simon, Jacob, Enos and Francis - and with them lie a large number of grandchildren. Side by side they lived and labored through life, and in death they lie together. They were a remarkable family, in youth active, energetic and intelligent, they were the stuff that has made Chester County what it is. Most of the family lived to middle age, and some to an advanced age, growing up living and dying near their boyhoods' home. It is rare that a family so numerous in our county with the western states offering new homes have been buried in one graveyard. Philip and John were the two last surviving members: the first named died June 27, 1869, in the 81st year of his age; and the latter on September 17, 1869, in the 63d year of his age. A number of the descendants of this worthy family still reside in the neighborhood. John Umpstead was taxed on 80acres, 2 stone houses, a stone barn, tanyard, 1 horse, 3 cattle, and 1 dog. Also listed in the 1810 Brandywine Twp Tax Return were a Philip Umpstead-inmate and Enos and William Umpstead-freemen. John is taxed on the same 80 acres and tanyard until 1835 when he sells? about 5/6 acres. DB A3:165 John Umstead of the twp. of Limerick in Montco bought of John Buchanan of West Caln Twp Chester Co in 1806. He, at least, bought land in Chester Co even earlier than the tax records suggest. DB B3:1 In 1807, John now of Brandywine Twp, Chester Co, tanner, bought land from Thomas England. This piece comes from the UM Research team, primarily the work of Eleanor Mayfarth and Barbara Wentz, with additional info from Don Shaner and some head-shaking by Cris in attempting to sort it all out. The question of which John was the tanner and which the inkeeper has haunted us for some years, but now it appears that they were one and the same.